Find here list of Chinese travel agency in Los Angeles and Monterey Park area in California. Able Tours, America Asia Travel Center / Super Vacation, Elite 5 Star Travel etc. 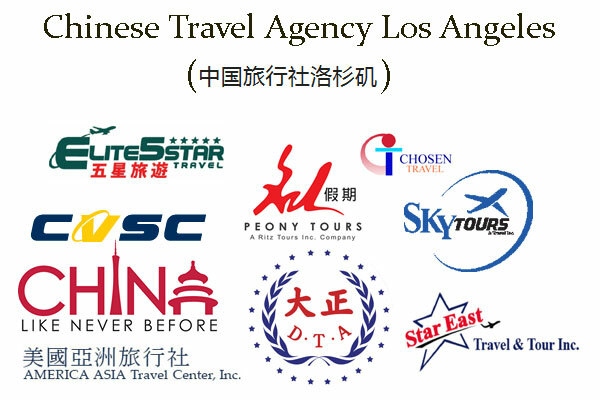 A full service Chinese travel agency in Los Angeles since 1986. CHINA VISA – Able Tours Los Angeles helps you apply for tourist visa, business visa, family visit visa, conference visa, China work visa, China student visa etc. Other services are document authentication, airline tickets etc. America Asia Travel Center, Inc. / Super Vacation Inc.
One of the leading Chinese travel agency in Monterey Park, CA. Travel company in Monterey Park, CA. Offers airline tickets, car rentals, hotel booking, resort, tour and cruise travel. Chinese travel agency in Monterey Park CA. Ritz / Peony tours offers luxury travel tours to China, Asia, Europe and more. Deluxe trips at affordable prices. Star East Travel & Tour Inc.
Travel Agency in Monterey Park, California. Services are major airlines ticketing, air + hotel, car rental, cruises, hotel booking, passport renew and visa application. Established in 1996, Travel Agency in Monterey Park, California. Offers tourism products wholesale, Chinese FIT, group reception, winter camp, high-end business trip, specific lines, exhibition groups, visa services, inviting the United States, information consultation, luxury cruise, US domestic air tickets, hotel booking etc. Sky Tours & Travel Inc. Full-service Chinese travel agency in Los Angeles, California. Offers flights, hotels, cars, cruises and insurance. China Visa Service Center Los Angeles Office helps residents get their China visa in Los Angeles and the following states: Arizona, Hawaii, New Mexico, Pacific Islands and Southern California counties: Imperial, Kern, Los Angeles, Orange, Riverside, Santa Barbara, San Bernardino, San Diego, San Luis Obispo, Ventura. Services : Application Pre-check, Passport Pick-up, Document Authentication Service, US Passport (New US Passport, Passport Renewal, Child Passport, Name Change, Lost/Damaged Passport), Chinese passport / travel permit, visa for other countries. Chinese Tourist information center in California. Travel agency in Burlingame, California.